Extensively tested, the Gen3 APL Glock’s concentrated, high-intensity tight beam fills your field of view for close to mid-range target identification. Now with 400 lumens of vibrant white light and weighing less than 3 ounces, it provides up to 1.5 hours of runtime. The water-resistant, glass reinforced polymer body is incredibly powerful yet compact in size. Integrating seamlessly with Glock rails, it offers constant and momentary operating modes. Textured paddles for a non-slip grip and ambidextrous on/off switches enable left or right hand activation. In addition, the easy-to-operate lockout system ensures the light isn’t activated until you’re ready. This Weapon Mounted light will fit the following model Glock Pistols 17, 17L, 19, 20, 21, 22, 23, 24, 30, 31, 32, 34, 35, 37, 38, 40, 41. Made In The USA. Non-slip switch controls constant and momentary functions. Made In The USA. 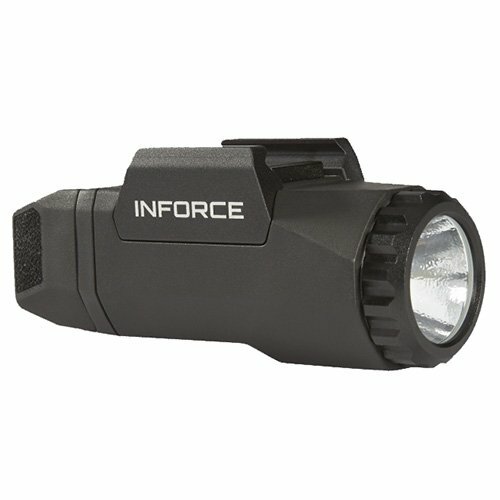 If you have any questions about this product by InForce, contact us by completing and submitting the form below. If you are looking for a specif part number, please include it with your message.